Sylvia White from Southampton diagnosed with a rare form of cancer says she’s been given a new lease of life after pioneering treatment abroad. She was hit with the devastating news she had a tumour behind her nose in 2014. Sylvia underwent months of gruelling chemotherapy and image-guided radiotherapy but the cancer had returned. To kill the cancer cells she underwent seven weeks of chemotherapy and image-guided radiotherapy in Southampton. After the treatment Sylvia and her family were faced with an anxious wait to see whether it had been successful. She was initially given the all-clear but tests showed the cancer had returned. 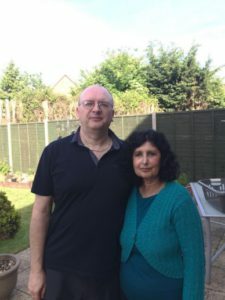 Sylvia was then faced with the tough decision of agreeing to yet more exhausting treatment in the UK, or cutting edge proton beam therapy in the Czech Republic. Unlike traditional radiotherapy, proton therapy targets and kills cancer cells while sparing the healthy tissue surrounding the tumour. On the advice of her doctors Sylvia travelled to Prague for nine weeks of treatment, covered by her BUPA health insurance. She is now cancer free.